John Scot Barrowman MBE (born 11 March 1967) is a Scottish-American actor, singer, presenter, author, and comic book writer. Born in Glasgow, Scotland, he moved to the United States with his family in 1975. Encouraged by his high school teachers, Barrowman studied performing arts at the United States International University in San Diego before landing the role of Billy Crocker in Cole Porter's Anything Goes in London's West End. Since his debut in professional theatre, Barrowman has played lead roles in various musicals both in the West End and on Broadway, including Miss Saigon, The Phantom of the Opera, Sunset Boulevard, and Matador. After appearing in Sam Mendes' production of The Fix, he was nominated for the 1998 Laurence Olivier Award for Best Actor in a Musical and, in the early 2000s, returned to the role of Billy Crocker in the revival of Anything Goes. His most recent West End credit was in the 2009 production of La Cage aux Folles. Barrowman is also featured on more than a dozen musical theatre recordings, including cover tunes found on his 2007 album, Another Side, and 2008's Music Music Music. Both albums accrued places on the UK Albums Chart, as did his self-titled John Barrowman (2010), which reached number 11, his highest chart placing to date. Furthermore, Barrowman has published two memoirs and autobiographies, Anything Goes (2008) and I Am What I Am (2009), with his sister Carole as co-author. The siblings also teamed up to write a novel, Hollow Earth (2012). The second book in the series, Bone Quill, has been released in the UK and was released in the US in July 2013. Barrowman was born in 1967 in Glasgow, the youngest of three children. He lived in Glasgow for the first eight years of his life. Barrowman's mother was a singer and worked as a clerk in a record shop while his father was employed by the Caterpillar heavy machinery company in Uddingston. In 1975, his father's company relocated the family to the United States, where his father managed the Caterpillar tractor factory in Aurora, Illinois. The family settled in Joliet, where Barrowman attended Joliet West High School in the heart of a "quintessentially middle-class conservative town". Barrowman's high school music and English teachers changed the future course of his life, with his music tutor instilling in him the love of performing, and his English teacher encouraging Barrowman to rise to his true artistic potential. His English teacher moved him into a Gifted Programme and coached Barrowman for the school's speech team. With the support of his teacher, Barrowman competed with other schools in statewide speech competitions, where he sharpened his skills reading scenes from plays. As a freshman, Barrowman won parts in several musical productions and from 1983 to 1986, he performed in such musical productions as Oliver!, Camelot, Hello, Dolly!, Li'l Abner and Anything Goes. Looking back, Barrowman acknowledges that "without the support he received in high school, chances are that he would not now be appearing in royal command performances in the West End in front of the Royal Family or having Stephen Sondheim ask him to play opposite Carol Burnett". Barrowman spent his senior year shovelling coal for an Illinois power company. His father had arranged the job (and similar jobs for his brother and sister) to give Barrowman the experience of manual labour. His father told him: "If you want to do manual labour for the rest of your life you'll know that when you do it; it's a choice. But if you don't like it, you'll understand the importance of educating yourself and – if you decide what you want to do – being good at your craft or your skill." Barrowman worked for the power company for the entire summer, but did not like the job. Eventually, he convinced the company to move him to work in the storeroom. Barrowman graduated from high school in 1985, and became a naturalised citizen of the United States (although he maintains dual citizenship of both the United Kingdom and the US). After he graduated from high school, he moved to San Diego, to study performing arts at the United States International University (USIU). As part of an exchange programme, he returned to his native Britain in 1989, to study Shakespeare for six months. Barrowman's professional acting career began in London's West End in 1989, playing the role of Billy Crocker in Cole Porter's Anything Goes at the Prince Edward Theatre, alongside Elaine Paige as Reno Sweeney and Bernard Cribbins as Moonface Martin. He continued to appear in West End productions for the next decade, taking the title role of Domingo Hernandez in Matador at the Queen's Theatre in 1991; as Raoul in The Phantom of the Opera at Her Majesty's Theatre in 1992; as Claude in Hair at the Old Vic Theatre in 1993; as Chris in Miss Saigon at the Theatre Royal, Drury Lane in 1993; as Joe Gillis in Sunset Boulevard at the Adelphi Theatre from 1994–1995; and as Beast in Beauty and the Beast at the Dominion Theatre in 1999. Barrowman was part of the musical Godspell in 1994, and was a soloist in two songs, "We Beseech Thee" and "On The Willows". He was lead vocalist on a rendition of Strike Up the Band in Who Could Ask for Anything More? A Celebration of Ira Gershwin at the Royal Albert Hall in 1996, and he was nominated for an Olivier Award for Best Actor in a Musical in 1998 for originating the role of Cal Chandler in The Fix, a performance he repeated in Cameron Mackintosh's 1998 gala concert Hey, Mr Producer!. Barrowman played Joe Gillis in Sunset Boulevard in the West End and, briefly, on Broadway. His only other Broadway credit is in the role of Barry in the Stephen Sondheim revue Putting It Together (1999–2000) at the Ethel Barrymore Theatre opposite Carol Burnett and George Hearn. In a review of Putting It Together, theatre critic Tom Samiljan noted Barrowman's "fine baritone voice and suave looks". In 2002, Barrowman appeared as Bobby in Sondheim's Company in the Kennedy Center's Stephen Sondheim Celebration. Barrowman returned to the role of Billy Crocker in Trevor Nunn's 2003 West End revival of Anything Goes, and appeared in West End non-musical dramas, such as his role as Wyndham Brandon in Rope at the Minerva Theatre, Chichester in 1993, and he starred as Lieutenant Jack Ross opposite Rob Lowe in the 2005 production of A Few Good Men. Barrowman starred in pantomime productions of Cinderella at the New Wimbledon Theatre (Christmas, 2005–06) and in Jack and the Beanstalk at Cardiff's New Theatre (Christmas, 2006–07). He played the title role in Aladdin at the Birmingham Hippodrome over Christmas 2007–8 and as a guest act for the Royal Variety Performance at the London Palladium in 2008. Barrowman played the lead in the Robin Hood pantomime at the Birmingham Hippodrome for the 2008–09 season. He presented Andrew Lloyd Webber's 60th birthday party in London's Hyde Park on 14 September 2008. Exactly one year later, Barrowman succeeded Roger Allam as Zaza/Albin in the West End revival of La Cage aux Folles, at the Playhouse Theatre. In Melbourne, Australia on 16 January 2018, Barrowman performed his first and only show to a packed audience at the Melbourne Arts Centre Hamer Hall. The audience was thrilled with the singer and many hope that he will keep his promise to return with "all the bells and whistles". Barrowman was one of the original hosts of Live & Kicking, a children's Saturday morning variety show on the BBC. During this time, he became known for his catchphrase, "it's a dirty rat! ", which he used during a phone-in game set in a haunted house. From 1993–1994, Barrowman reported on technology news as the host of the Electric Circus segment of the show. He appeared on the children's television game show, The Movie Game from 1994–1996. Barrowman was one of the regular presenters on Channel 5's afternoon show 5's Company from 1997–1999. Barrowman read bedtime stories on the CBeebies channel between 1 and 5 May 2006. That summer, Barrowman was on a Judges panel with Andrew Lloyd Webber, David Ian, and Zoe Tyler on BBC One's music talent show How Do You Solve a Problem like Maria?. In the same year, Barrowman made two television appearances on New Year's Eve: He talked about spirituality and civil partnerships on BBC Television's Heaven & Earth, hosted by Gloria Hunniford, and he appeared as a guest on Graham Norton's one-off BBC Television programme, The Big Finish, teaming up with Craig Revel Horwood and Louis Walsh to take a lighthearted look at news stories in 2006. On 11 February 2007, Barrowman co-presented coverage of the BAFTA Film Awards, along with Ruby Wax for E! : Entertainment Television. On 11 and 18 February 2007, Barrowman guest-presented two editions of Elaine Paige on Sunday, a pre-recorded BBC Radio 2 weekly musical theatre and film music showcase. In 2007, Barrowman was a judge on the BBC One TV series Any Dream Will Do, hosted by Graham Norton. The show searched for a new, unknown actor to play the role of Joseph in a West End revival of the Andrew Lloyd Webber musical Joseph and the Amazing Technicolor Dreamcoat, eventually choosing Lee Mead. He guested on the BBC Two comedy panel quiz show Never Mind the Buzzcocks (Series 19, Episode 5), challenging host Simon Amstell to a "gay-off". He also guested on Al Murray's Happy Hour, The Charlotte Church Show, and Friday Night with Jonathan Ross. On 27 July 2007, Barrowman guest hosted The Friday Night Project, on Channel 4. In 2008 Barrowman presented a primetime BBC game show called The Kids Are All Right. On the show, four adults compete against seven "smart and sassy" children for cash in four rounds "testing their brainpower, knowledge and speed of response". On 16 and 23 February 2008, he presented the National Lottery Draw. In 2012, Barrowman guest presented three episodes of This Morning with Kate Thornton. In July 2012, Barrowman co-hosted the G4's 2012 Live Comic Con in San Diego with Candace Bailey. In 2013, Barrowman began hosting the BBC One game show Pressure Pad and in 2014, he hosted Channel 4 show Superstar Dogs: Countdown to Crufts, which began airing on 17 February 2014. In 2014, Barrowman hosted the Channel 4 programme Small Animal Hospital and in October 2016, he was a guest team captain for an episode of Celebrity Juice and he guest presented an episode of The One Show. Barrowman's television career began with several appearances in short-lived prime-time soap operas. Barrowman first starred as Peter Fairchild in Central Park West (1995) a show American film critic Ken Tucker calls "a tale of ritzy, ditsy New York City careerists—some struggling to make it, others plotting to retain their status and power." Television critic David Hiltbrand called Barrowman's character a "Prince Charming ... a virtuous, hardworking assistant DA who keeps getting distracted by women who swoon in his path." Tucker noted Barrowman's character of Peter Fairchild to be "physically an eye-widening cross between John Kennedy Jr. and Hugh Grant". The show lasted for two seasons on CBS, from September 1995 to June 1996. Barrowman then appeared as Peter Williams in Titans (2000). According to writer Joanna Bober, in Titans, Barrowman plays a "ruthless mogul" who gains "control of the family's private aviation company (a fleet of 'Titans') from his semi-retired father" while increasing the profitability of the company amidst a series of soap opera intrigues. Titans was cancelled after airing eleven episodes. Barrowman was also considered for the role of Will in Will and Grace, but the producers reportedly felt he was "too straight" and the role eventually went to straight actor Eric McCormack instead. Commenting on the decision, Barrowman remarked, "The sad thing is it's run by gay men and women." On 25 March 2008, Barrowman made a guest appearance in episode 22 of the BBC's Hotel Babylon. Entertainment Weekly reported that Barrowman would appear in the 2010 season of Desperate Housewives, "for a minimum of five episodes, portraying Patrick Logan, the ex-boyfriend at the center of the Angie Bolen (Drea de Matteo) mystery." On 23 February 2010 Barrowman announced on The One Show that his contract had been extended to a total of six episodes. Barrowman starred in the ABC drama series pilot Gilded Lillys created and produced by Shonda Rhimes. Since 2012, Barrowman has portrayed Malcolm Merlyn, one of the main antagonists in The CW series Arrow. Barrowman was a recurring cast member for the first two seasons and was promoted to a main cast member beginning with the third season. By July 2016, he signed a deal that allows him to continue being a series regular on Arrow as well as the other superhero shows produced by Greg Berlanti, including The Flash and Legends of Tomorrow. In the Flash third season episode “Duet”, he plays gangster Cutter Moran in the dreamworld the Music Meister sets up. Despite announcing in May 2017 that he is leaving the Arrowverse television franchise,, Barrowman returned as Malcolm Merlyn in the second part of the Elseworlds crossover, hallucinated by Barry Allen, situated in a universe rewritten by the Book of Destiny where Allen is perceived to be Oliver Queen. When reality is rewritten again, Merlyn is situated as a Central City Police officer who arrests Barry and Oliver, rewritten as the Trigger Twins. Barrowman appeared as Ben Carpenter in the low-budget film Shark Attack 3: Megalodon (2002). His musical abilities are featured in several film roles: as Jack in the Cole Porter biopic De-Lovely (2004), singing a duet with Kevin Kline on the song "Night and Day"; and as the lead tenor Stormtrooper in The Producers (2005), singing "Springtime for Hitler". Barrowman co-presented and performed in the BBC One series The Sound of Musicals (2006). Barrowman took part in the reality television series Dancing on Ice on ITV1 in January and February 2006. Resembling a real ice skating competition, ice dancers Jayne Torvill and Christopher Dean trained celebrities to compete on the show. His skating partner was World Junior Gold Medalist and three-time Russian champion Olga Sharutenko. On 4 February, despite being one of the favourites to win, Barrowman and Sharutenko faced Stefan Booth and his partner Kristina Lenko in the skate off and were eliminated by the judges' by a vote of 3 to 2. He was one of five celebrity guests on the Strictly Come Dancing Christmas Special (2010), and achieved both the top score and also first place when the audience vote had been counted. His professional partner was Kristina Rihanoff and they danced the Quickstep. In September 2012 Barrowman was a guest host on Attack of the Show!. On 12 November 2018, Barrowman was confirmed to be participating in that year’s series of I'm a Celebrity...Get Me Out of Here!. He eventually finished third behind Emily Atack and Harry Redknapp. Barrowman is best known in the UK for his role in the BBC science fiction drama Doctor Who. When the series was revived in 2005, Barrowman came on board as recurring guest character Captain Jack Harkness, a pansexual time traveller from the 51st century. His first appearance as Harkness was in the two-part story "The Empty Child"/"The Doctor Dances". He went on to appear in the next three episodes, "Boom Town", "Bad Wolf" and "The Parting of the Ways". Jack became so popular, he was given his own show – Torchwood, a Doctor Who spin-off series featuring a team of alien hunters based in modern-day Cardiff, which premiered in 2006. 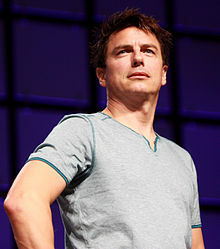 American film and television critic Ken Tucker describes Barrowman's role on Torchwood as "dashing", "utterly fabulous", "celestially promiscuous", and "like Tom Cruise with suspenders, but minus the Scientology". In the show, Jack "tracks down—and occasionally beds—ETs with the help of his quartet of bedazzled groupies—slash—Experts in Their Fields: One's a doctor, one's a cop, one's a scientist, and one... makes coffee and late nights piping hot. It's like the Justice League of Extended-Pinkie Nerds." Barrowman continued to guest star in Doctor Who in 2007, appearing in "Utopia", "The Sound of Drums", and "Last of the Time Lords". He also participated in a Doctor Who special on the BBC's The Weakest Link. In 2008, Barrowman appeared in the two-part 2008 series finale, "The Stolen Earth"/"Journey's End" and reprised the role of Captain Jack Harkness in the "Doctor Who: Tonight's the Night" special. In 2010, Barrowman returned to Doctor Who with a cameo in The End of Time along with other previous stars. Series 3 of Torchwood was broadcast in July 2009 as a miniseries of five episodes called Children of Earth. Filming of Series 4 called Torchwood: Miracle Day began on 11 January 2011 primarily in Los Angeles, and in and around Cardiff, Wales. The first episode of Miracle Day aired on Starz Network in the United States on 8 July 2011 and was broadcast on BBC One in the UK on 14 July 2011. Both Doctor Who and Torchwood became popular in the United States on the BBC America network. In November 2013 he appeared in the one-off 50th anniversary comedy homage The Five(ish) Doctors Reboot. Since 2015 he has continued to appear in an ongoing series of Torchwood audio plays for Big Finish Productions. Barrowman's memoir and autobiography, Anything Goes, was published in 2008 by Michael O'Mara Books. His sister, English professor and journalist Carole Barrowman, helped write the book using her brother's dictations. In 2009, Barrowman published I Am What I Am, his second memoir detailing his recent television work and musings on fame. Barrowman's first published work of original fiction was a Torchwood comic strip, titled Captain Jack and the Selkie, co-written with sister Carole. Commenting on the characterisation of Jack Harkness in the comic strip Barrowman states: "We’d already agreed to tell a story that showed a side of Jack and a part of his history that hadn’t been explored too much in other media. I wanted to give fans something original about Jack." Barrowman's début fantasy novel titled Hollow Earth, co-written with his sister Carole, was published in the United Kingdom on 2 February 2012 by Buster Books. The novel is about twins Matt and Emily ("Em") Calder who share an ability that allows them to make artwork come to life, due to their powerful imaginations. Their ability is sought after by antagonists who wish to use it to breach Hollow Earth—a realm in which all demons and monsters are trapped. Two sequels from the same team concerning Hollow Earth followed - The Bone Quill (2013) and The Book of Beasts (2014) - and Conjuror (2016), the first in a new series (the "Orion Chronicles") featuring the same twins, as well as a separate novel Torchwood: Exodus Code (2013). Barrowman learned an American accent after school children picked on his Scottish accent when he moved to the United States. His General American accent is often said to hint at, or is called, Mid-Atlantic. Barrowman is openly gay: he met his husband, Scott Gill, during a production of Rope at the Chichester Festival Theatre in 1993, after Gill came to see Barrowman in the play. The couple have houses in London, England; Cardiff, Wales; and Palm Springs, California. Barrowman and Gill entered into a civil partnership on 27 December 2006. A small ceremony was held in Cardiff with friends and family, with the cast of Torchwood and executive producer Russell T Davies as guests. The pair were legally married in the state of California on 2 July 2013, following the United States Supreme Court's decision to deny an appeal to overturning California Proposition 8 in Hollingsworth v. Perry. On 30 November 2008, Barrowman exposed himself during an episode of Radio 1's Switch programme. Although the act was not seen (a show staff member had covered the webcam), the BBC and Barrowman subsequently apologized for any offense caused. In mid-March 2017, Barrowman and his husband held a "big bad garage sale" in their Palm Springs home. The garage sale was packed with Doctor Who and Torchwood memorabilia. Neighbours and fans showed up for the occasion and Barrowman documented most of the day on his social media accounts via pictures and short videos. Barrowman worked with Stonewall, a gay rights organisation in the UK, on the "Education for All" campaign against homophobia in the schools. In April 2008, the group placed posters on 600 billboards that read, "Some people are gay. Get over it!" Barrowman contributed his support to the project asking people to join him and "Help exterminate homophobia. Be bold. Be brave. Be a buddy, not a bully." That same month, Barrowman spoke at the Oxford Union about his career, the entertainment industry, and gay rights issues. The event was filmed for the BBC programme The Making of Me, in an episode exploring the science of homosexuality. He was voted Entertainer of the Year in 2006 by Stonewall (UK) and placed on the Out 100 list for 2008, an annual list of notable LGBT people compiled by Out magazine. In June 2010, Barrowman met with the then Conservative Prime Minister, David Cameron, as a representative of the LGBT community. Barrowman was one of 48 British celebrities who signed a public notice warning voters against Conservative Party policy towards the BBC prior to the 2010 general election. In 2011, he released his own skin care line, entitled HIM. In the 2012 presidential election, Barrowman endorsed Democrat Barack Obama, who was running for re-election. Barrowman publicly supported Scotland remaining part of the United Kingdom in the 2014 Scottish independence referendum, and was one of 200 public figures who were signatories to a letter to The Guardian opposing independence. The Doctor Episode: "The Guru"
Dr. Dean Deville Episode: "Eat Yourself Slender"
2004 Columbia Performs the song "Night and Day"
2004 Sony BMG Performs the song "Springtime for Hitler"
Barrowman was appointed Member of the Order of the British Empire (MBE) in the 2014 Birthday Honours for services to light entertainment and charity. In July 2011, Barrowman was awarded an honorary degree from the Royal Conservatoire of Scotland. For the role of Captain Jack Harkness in Torchwood: Miracle Day, Barrowman was long listed in the category Drama Performance: Male at the 2012 National Television Awards. Human Rights Campaign Visibility Award on 5 November 2016 for advocating on behalf of the LGBTQ community, including equality and justice for LGBTQ youth. ^ "Interview: John Barrowman". Musichel. Retrieved 17 June 2013. ^ Sam Delaney (16 November 2008). "John Barrowman: he'll do anything". The Telegraph. Retrieved 23 September 2014. ^ Sarah Ewing (18 July 2014). "John Barrowman: My family values". The Guardian. Retrieved 23 September 2014. ^ a b "John Barrowman." (2009). Contemporary Theatre, Film, and Television. 92. Farmington Hills, Michigan: Gale. ^ "The house that Captain Jack built – Profiles – People – The Independent". The Independent. Retrieved 26 January 2014. ^ a b Anstead, Mark (11 May 2007). "My Best Teacher". Times Educational Supplement. ISSN 0040-7887. Archived from the original on 15 February 2012. Retrieved 12 December 2009. ^ a b "People". Times Educational Supplement (4736). 14 March 2008. ISSN 0040-7887. Archived from the original on 15 February 2012. Retrieved 12 December 2009. ^ Luaine, Lee (27 August 2007). "John Barrowman stars in BBC America's 'Torchwood'". The Miami Herald. Archived from the original on 27 September 2007. Retrieved 28 August 2007. ^ a b Portantiere, Michael (10 January 2000). "Playbill: Dear John: Barrowman Puts It All Together on Broadway News". Playbill. Archived from the original on 6 December 2008. Retrieved 26 January 2008. ^ a b Holden, Stephen (25 February 2002). "Cabaret Review; Confessions of a Yankee Doodle Dandy". The New York Times. ^ "ohnotheydidnt: David Tennant & John Barrowman interviews, Doctor Who wins award". community.livejournal.com. Archived from the original on 15 March 2011. Retrieved 5 August 2010. ^ "Ken Mandelbaum's MUSICALS ON DISC: Always, etc". Playbill. 17 August 1997. Retrieved 5 March 2018. ^ a b "1998 Olivier Awards winners and nominations". Albermarle of London. Archived from the original on 26 September 2007. Retrieved 21 May 2007. ^ Samiljan, Tom (29 January 2000). "Sondheim's "Putting it Together"". Billboard. 112 (5): 39. ^ Isherwood, Charles (17 June 2002). "Connecting the dots in 2 Sondheim tuners". Variety. 387 (5): 31. ^ a b Rebello, Stephen (12 October 2004). "He's delightful, he's delicious: De-Lovely's John Barrowman on singing Cole Porter and flashing his bum". The Advocate (924): 88–89. ISSN 0001-8996. ^ Rosenthal, Amy (20 January 2003). "All-singing and dancing: Amy Rosenthal gets a kick out of a sparkling thirties satire on the cult of celebrity". New Statesman. 132 (4621): 44. ^ "John Barrowman to play Aladdin!" (Press release). Birmingham Hippodrome. 5 June 2007. Retrieved 5 June 2007. ^ "2008 Royal Variety Performance, London Palladium". Entertainment Artistes' Benevolent Fund. Archived from the original on 19 January 2010. Retrieved 4 December 2009. ^ Gans, Andrew (19 December 2008). "Barrowman Is Robin Hood Beginning Dec. 19 in the UK". Archived from the original on 8 November 2009. Retrieved 22 December 2009. See also: Drinkwater, Mark (11 December 2008). "Panto with a familiar feel". Community Care (1751): 18. ISSN 0307-5508. ^ What's On Stage.com Archived 21 October 2012 at the Wayback Machine John Barrowman as Zaza; retrieved 1 November 2009; Keith Prowse.com John Barrowman in La Cage aux Folles – Retrieved 1 November 2009; Mountford, Fiona (6 October 2009). "Best of times for Barrowman as La Cage ups the fun level". Evening Standard. p. 17. ^ "John Barrowman". Gavin Barker Associates Ltd. Archived from the original on 14 April 2012. ^ "How Do You Solve a Problem Like Maria? panel chosen" (Press release). BBC. 6 June 2006. Hale, Mike (6 June 2009). "A search for a star, with a 3-year delay". The New York Times. 158 (54698): C8. ^ a b 'Kurly' (15 December 2006). "Catching you up through 2007". Torchwood.TV. Retrieved 13 January 2007. ^ JohnBarrowman.com Webmaster (12 January 2007). "JB on the Radio". John Barrowman Official Site – News. Archived from the original on 15 January 2007. Retrieved 13 January 2007. John will guest presenting Elaine Paige's BBC Radio 2 show on both the 11th and 18th of February. The shows will be pre-recorded and you can listen online at www.bbc.co.uk/radio2/shows/paige. ^ "Lee won because he is polished, professional and close to perfection in what he does. He goes on stage and commands it, and one of the best qualities about him is that he doesn't analyse the song too much. He just gets out there and does it. I'm happy to give over my West End leading man's shoes for a while, to allow him to fill them." "Public vote says West End in need of Lee Mead" (Press release). BBC. 8 February 2008. Retrieved 13 August 2008. On a post-final party video posted at Andrew Lloyd Webber's website, Barrowman commented "The West End had need of Lee Mead". Bill Kenwright, John Barrowman (13 June 2008). Bill and John at the Aftershow Party (Windows Media Video). BBC Television Centre: AndrewLloydWebber.com. Archived from the original on 15 October 2007. ^ John Barrowman (27 July 2007). "Episode 9". The Friday Night Project. Series 9. Channel 4. An example of Barrowman speaking with a Scottish accent with his parents can be seen in the first episode of the BBC One documentary programme, The Making of Me (2008). See Cooke 2008, "Three cheers for the X factor, What makes a man gay? ", New Statesman, 28 July 2008. ^ "John Barrowman to host prime time BBC One show The Kids Are All Right" (Press release). BBC. 19 October 2007. Retrieved 13 February 2008. The show was recorded in the new BBC studios in Pacific Quay in Glasgow. See: "BBC: The Kids are All Right". BBC.co.uk. BBC. Archived from the original (SHTML) on 23 November 2007. Retrieved 13 February 2008. ^ Hurrell, Will (3 September 2008). "Barrowman to meet talented animals". Broadcast. ^ "BBC – CBBC Programmes – Animals at Work". BBC Online. ^ Fletcher, Alex (27 June 2012). "John Barrowman, Emma Willis among 'This Morning' summer guest hosts – TV News – Digital Spy". Digital Spy. Retrieved 8 July 2012. ^ "John Barrowman to present new Channel 4 daytime series Superstar Dogs – TV News". Digital Spy. 15 January 2014. Retrieved 14 July 2014. ^ "Small Animal Hospital". RadioTimes. ^ "Send in the clones". People. 44 (14): 88. 2 October 1995. ISSN 0093-7673. The article profiles Barrowman's role as Peter Fairchild in the show Central Park West and his reported similarity to John F. Kennedy, Jr., along with Steven Eckholdt in The Monroes. The article takes a very lighthearted look at the similarities between the two actors and JFK Jr. in table format. Under an entry for "Love Life", it says Barrowman "has been linked with Cher." ^ a b Tucker, Ken (22 September 1995). "Central Park West". Entertainment Weekly (293): 66. ^ Hiltbrand, David (18 September 1995). "Central Park West". People. 44 (12): 21. ISSN 0093-7673. ^ Bober, Joanna (September 2000). "John Barrowman". Interview. 30 (9): 84. ^ "Gay Doctor Who star was too straight for Will and Grace". Pink News. 13 January 2006. ^ "Hotel Babylon series three: Credits" (Press release). BBC. 8 February 2008. Retrieved 12 February 2008. ^ Ausiello, Michael (30 January 2010). "Scoop: 'Desperate Housewives' snags John Barrowman". Entertainment Weekly. Archived from the original on 1 February 2010. ^ Michael Ausiello (6 March 2012). "Pilot Scoop: Torchwood's John Barrowman to Star in Shonda Rhimes ABC Pilot Gilded Lilys". TV Line. Retrieved 9 March 2012. ^ Mitovich, Matt Webb (8 July 2016). "Arrow's John Barrowman Now a Series Regular Across All CW/DC Shows". TV Line. Retrieved 8 July 2016. ^ Peters, Megan. "Arrow: John Barrowman Confirms He's Done With The Arrowverse". ComicBook.com. Retrieved 27 May 2017. ^ Deans, Jason (2 September 2005). "It's showtime on BBC1". London: guardian.co.uk. ^ "Celebrities set for Dancing on Ice". RTÉ.ie. 4 January 2006. ^ "Barrowman is Dancing on Ice favourite". RTÉ.ie. 17 January 2006. ^ "Doctor Who star exits Dancing on Ice". RTÉ.ie. 6 February 2006. ^ Harp, Justin (12 November 2018). "Meet ALL the stars of I'm a Celebrity 2018 – including John Barrowman, EastEnders' Rita Simons and more!". Digital Spy. ^ "'King' Harry Redknapp helps make I'm A Celebrity 2018 a ratings hit". BBC News. BBC News. Retrieved 10 December 2018. ^ Tucker, Ken (7 March 2008). "Work That Bawdy". Entertainment Weekly (981): 79. See also: Lowry, Brian (20 July 2009). "Beeb summer fare proves tasty:... and Capt. Jack is crackerjack". Variety. 415 (9): 19. "Hot Picks: Drama". The Advocate (992): 54. 11 September 2007. ^ Blair, Alan (26 November 2007). "Capt. Jack Returns to "Doctor Who"". Airlock Alpha. Retrieved 12 February 2007. ^ "David Tennant makes surprise return to the TARDIS!". BBC. 22 May 2009. Retrieved 24 May 2009. ^ Hale, Mike (18 July 2009). "Gay Heroes and a Reptilian Monster, From the BBC". The New York Times. 158 (54740): C1. ^ "Interview with Russell T. Davies". Collider.com. 20 November 2013. Retrieved 5 December 2013. ^ "Lifestyle – Showbiz – Torchwood star can't wait to start new series". WalesOnline. 4 July 2010. Retrieved 26 June 2012. ^ "Autobiography release dates confirmed". Archived from the original on 9 January 2008. ^ Weintraub, Joanne (4 September 2007). "His own universe". News. Milwaukee Journal Sentinel. ^ "Roll Out the Barrowman". The Bookseller (5382): 46. 15 May 2009. ISSN 0006-7539. ^ McCarthy, James (18 February 2009). "Torchwood's John Barrowman gets help for comic turn". Western Mail. Retrieved 19 February 2009. ^ "Hollow Earth". Buster Books. Retrieved 14 January 2012. ^ Fisher, Christopher (1 December 2006). "John Barrowman". Scotland Magazine. p. 28. Retrieved 10 December 2009. ^ a b O'Connor, Gavin (28 December 2006). "Torchwood star in celebrity ceremony". icWales. South Wales Echo. Retrieved 26 May 2013. ^ "Torchwood star's civil ceremony". BBC News. BBC. 27 December 2006. Retrieved 27 December 2006. ^ "John Barrowman getting married to Scott Gill in California today". Digital Spy. 2 July 2013. Retrieved 2 July 2013. ^ Leigh Holmwood "John Barrowman apologizes for exposing himself on BBC Radio 1", The Guardian, 2 December 2008. ^ "Barrowman sorry for radio flash". BBC. 1 December 2008. Retrieved 8 December 2009. ^ Metro.co.uk, Hannah Lawrence for (18 March 2017). "John Barrowman is holding an epic Doctor Who garage sale". Metro. Retrieved 13 April 2017. ^ "John Barrowman's massive garage sale is PACKED with Doctor Who items". RadioTimes. Retrieved 13 April 2017. ^ "Education for All". Stonewall. Archived from the original on 10 January 2010. Retrieved 23 December 2009. ^ Cooke, Rachel (28 July 2008). "Three cheers for the X factor, What makes a man gay? The question, mercifully, is too complex to answer". New Statesman. 137 (4907): 38. ISSN 1364-7431. ^ "John Barrowman, Sugar Rush, Sheri Dobrowski, Mail on Sunday win accolades at Stonewall Awards" (Press release). Stonewall (UK). 3 November 2006. Retrieved 3 November 2006. ^ Gans, Andrew (17 November 2008). "Annual Out 100 List Celebrates Jackson, O'Hare, Bell, Bowen, Albee, Arias and More". Playbill. Archived from the original on 15 October 2012. Retrieved 15 December 2009. ^ "John Barrowman Meets David Cameron". Johnbarrowman.com. 16 June 2010. Retrieved 5 December 2013. ^ "General Election 2010: leading stars oppose Tory BBC plans". The Daily Telegraph. London. 25 April 2010. ^ "The Grooming Guru Awards 2011". Groomingguru.co.uk. Retrieved 5 December 2013. ^ "John Barrowman support for Obama – ITV News". Itv.com. 10 May 2012. Retrieved 9 October 2012. ^ "Fish turns down Yes role over Germany move". Edinburgh Evening News. 17 July 2014. Retrieved 19 July 2014. ^ Moore, Joe [@JoeMooreDesign] (21 July 2018). "Special thanks to the super-awesome @JohnBarrowman for providing the voice of Malcolm Merlyn in @LEGODCGame. ^_^ #LEGODCSuperVillains" (Tweet) – via Twitter. ^ "No. 60895". The London Gazette (Supplement). 14 June 2014. p. b16. ^ "Queen's Birthday Honours: awards for Tom Devine, John Barrowman and hundreds of others". Herald Scotland. 13 June 2014. Retrieved 14 July 2014. ^ Wightman, Catriona (27 September 2011). "National Television Awards 2012: The nominees". Digital Spy. Barrowman, John; Barrowman, Carole (2008). Anything Goes. Michael O'Mara Books. ISBN 1-84317-289-5. Barrowman, John; Barrowman, Carole (2009). I Am What I Am. Michael O'Mara Books. ISBN 978-1-84317-379-3. Galliano, Joseph (2009). Dear Me: A Letter to My Sixteen-Year-Old Self. Simon & Schuster. ISBN 1-84737-766-1. Wikimedia Commons has media related to John Barrowman.